Telemedicine is now becoming an important feature for EHR and practice management systems. Join industry leaders and seamlessly integrate secure video visits into your clients’ clinical workflow. More and more patients are booking appointments online for a single reason: convenience. Take convenience to the next level by enabling patients to book secure video visits in your self-scheduling app. Does your medical device require follow-up with a patient’s prescribing physician? Easily integrate secure video visits into this follow-up regimen to create an end-to-end workflow for your clients. Ready to enable HIPAA-compliant video visits in your application? At the core of Chiron Health’s telemedicine API is seamless patient scheduling integration. 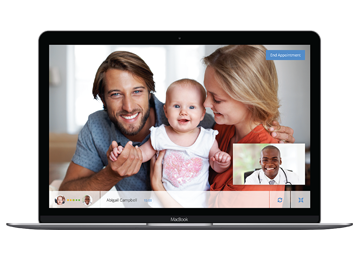 Your clients can now schedule video visits directly in your application and all necessary information will be synced with Chiron Health — eliminating any duplicate work for practice staff or patients. This functionality is ideal for EHR/PM vendors and well as patient self-scheduling apps. Once an appointment has been scheduled, Chiron Health automatically checks the patient’s eligibility for reimbursement using the Chiron Rules Engine, an industry-first telemedicine insurance rules database. This rules engine is supplemented by Chiron’s team of telemedicine reimbursement experts, working on your clients’ behalf to resolve any billing issues. Now that the visit has been scheduled in your system and Chiron has verified the patient’s insurance eligibility, your client is able to connect with the patient through an encrypted peer-to-peer video connection. All clinical documentation is completed directly in your application — Chiron simply handles the HIPAA-compliant video.